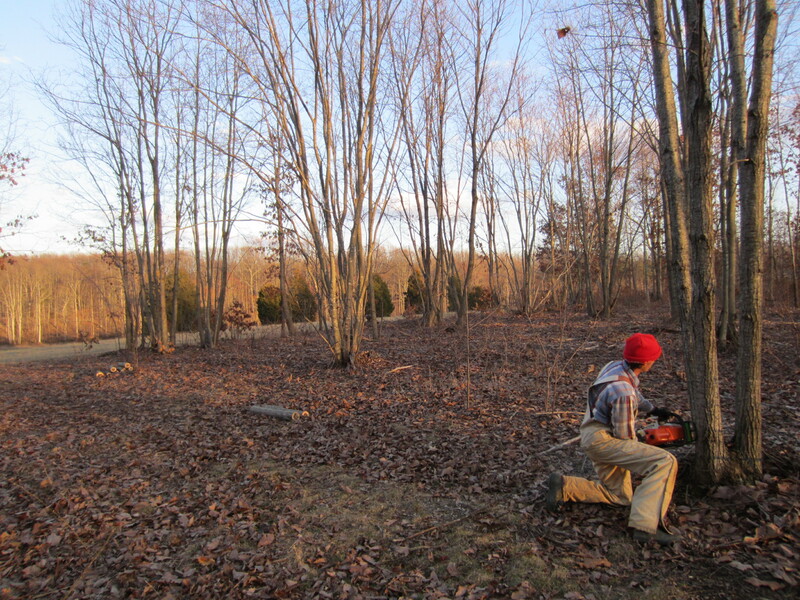 Sunday evening we cut 57 oak logs for our shiitake production this year. We have tons of oak trees growing in our woods that are the perfect diameter for growing shiitake mushrooms. 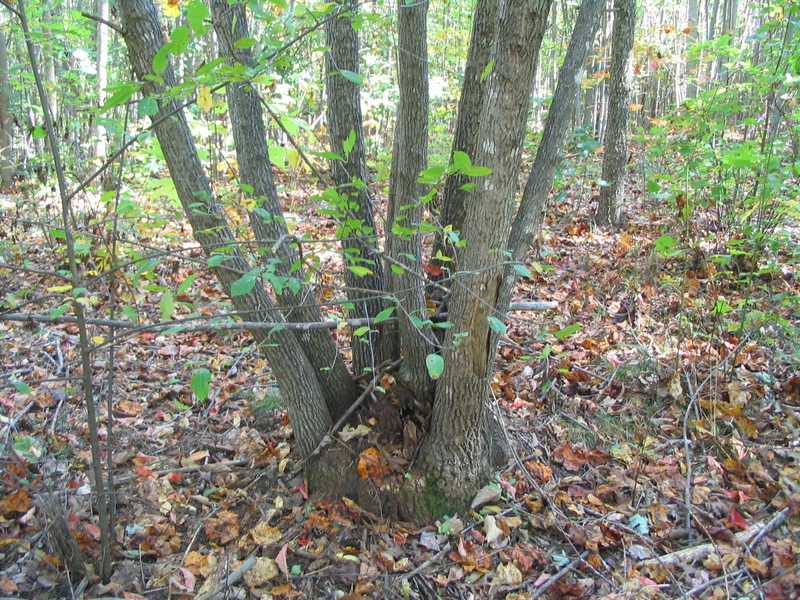 Our wooded area was cut over about 15 years ago, and many of the stumps have re-sprouted clusters of trees. If these trees are not thinned out they will self-select (meaning some will rot and die) anyway, so it seems a good use of our resources to cut and thin some of the trees and use them for growing mushrooms. Shiitake mushrooms are notable for their medicinal qualities… and also delicious. We hope our experiment will be successful this year so that we can increase our production in future years. 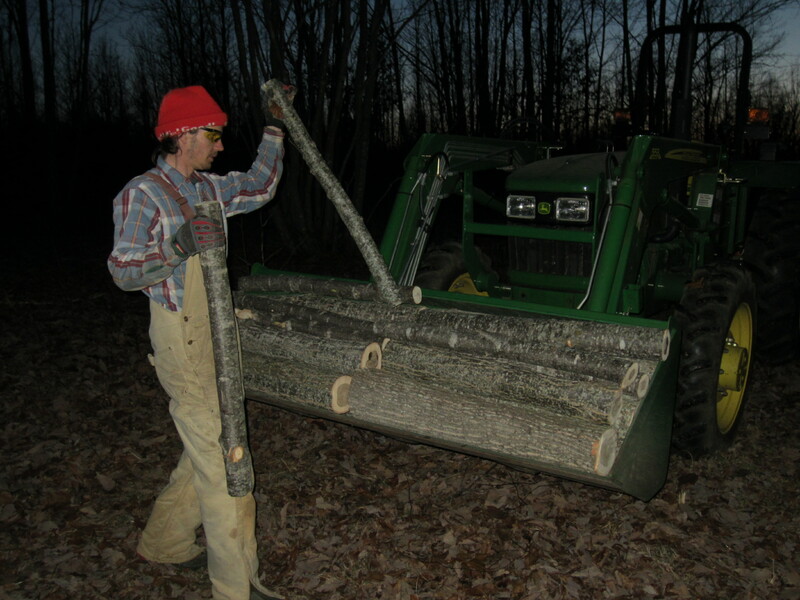 We cut the logs to 36″. It would be too much weight for us to handle longer logs, since we have to move them so many times during the process of production. 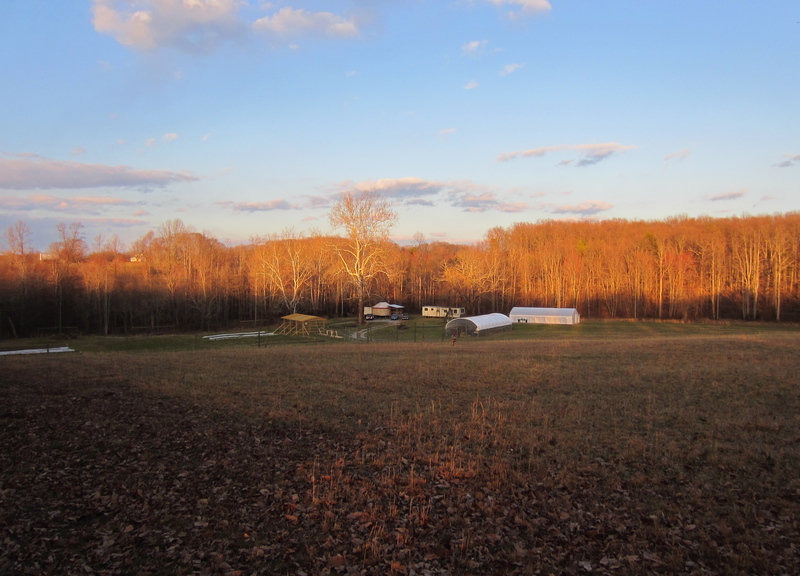 A view of the farm compound from up on the hill. 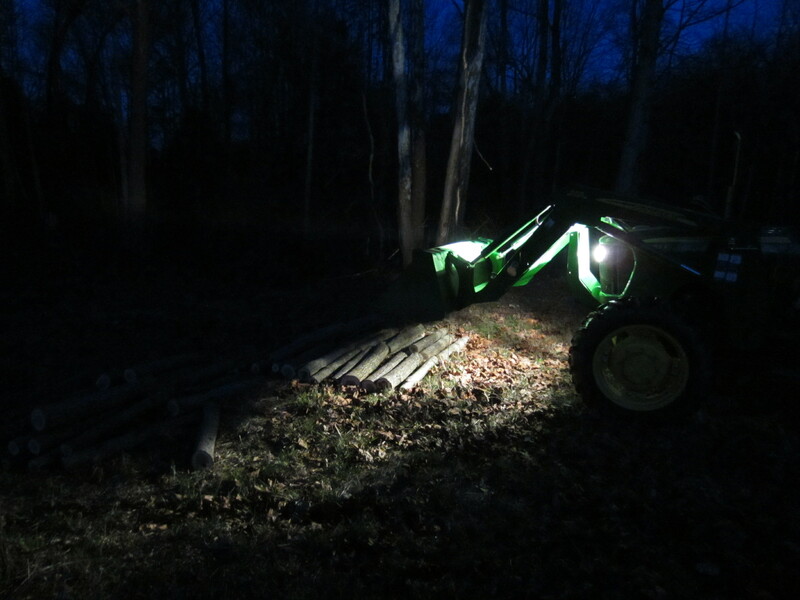 Seems like we are always scrambling to finish up a project as it is getting dark. Not enough time in the day. I can’t wait for Sunday and the extra hour of daylight. The cutting process took a few hours. 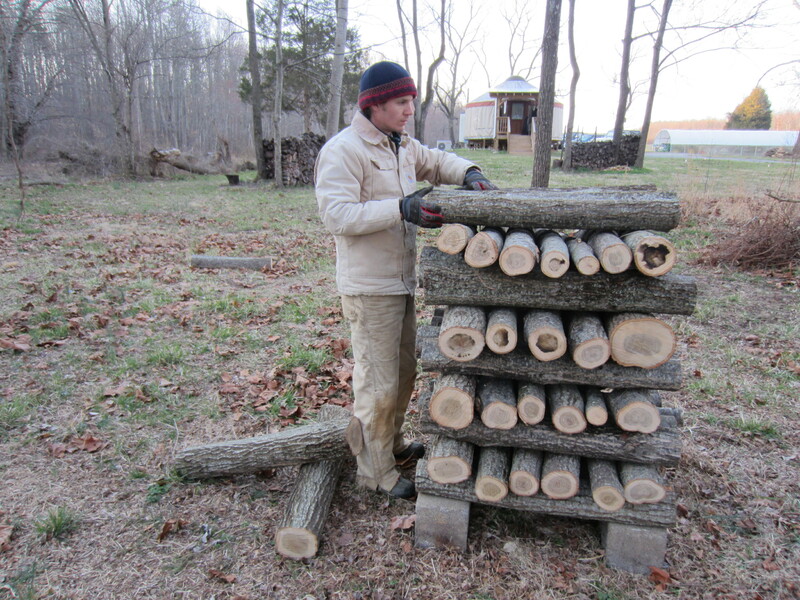 Most of the logs are the perfect diameter; we’ll use the larger logs first. 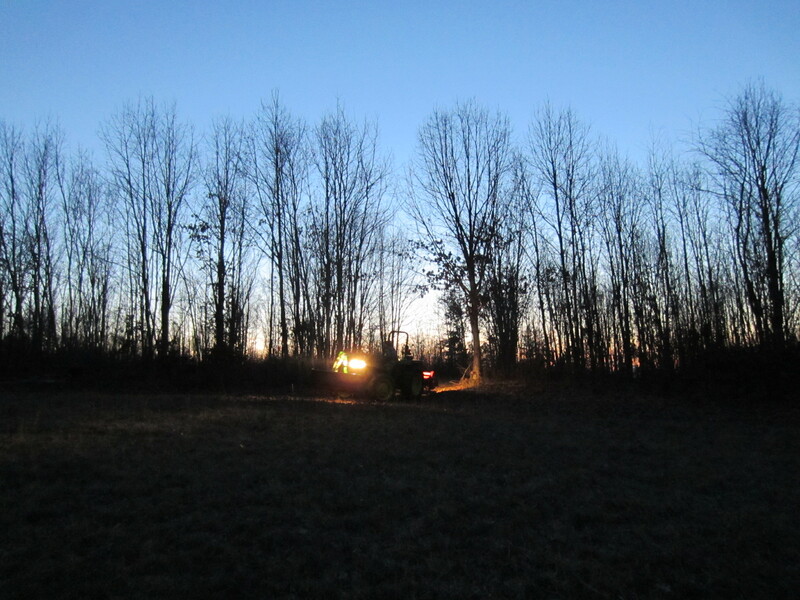 The tractor carried them down the hill to the wooded area behind the yurt where we will inoculate the logs. Next morning, stacking them. We will be inoculating this weekend! Then we wait many months until they will hopefully fruit! 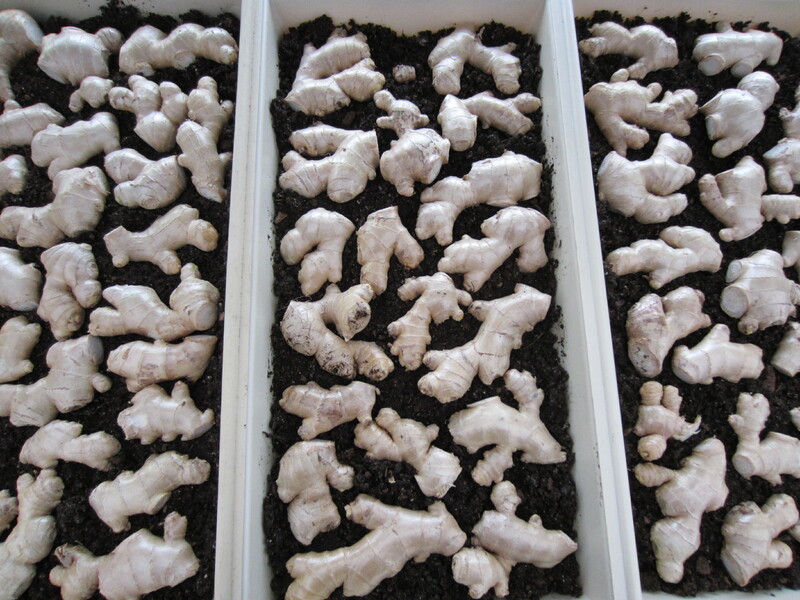 Our organic ginger ‘seed’ arrived yesterday and I set it in trays for the pre-sprouting process. Here they are before I covered them up. Another yummy medicinal food we are growing this year! It has been hard to find a time to get out in the field and till due to wet weather, but we finally had a small window of opportunity this week. Next week I will be busy planting asparagus, onions, and raspberries!